I bought two lawn chairs last year when Target had them on clearance. Oh, I KNOW you know the magnetic pull that is a 50-70% off sale at Target. They were white aluminum with yellow (plastic) woven webbing and under $10 each. A series of events (rain, summer sun, etc) mixed with a bit of neglect left them in shambles. Like, a guest at my kids’ birthday party fell through one! Don’t worry, they weren’t seriously hurt. Unless you count their pride because…kids. They like to giggle when adult bums go through chairs. I knew something had to be done. I didn’t want to just throw them away, you know? 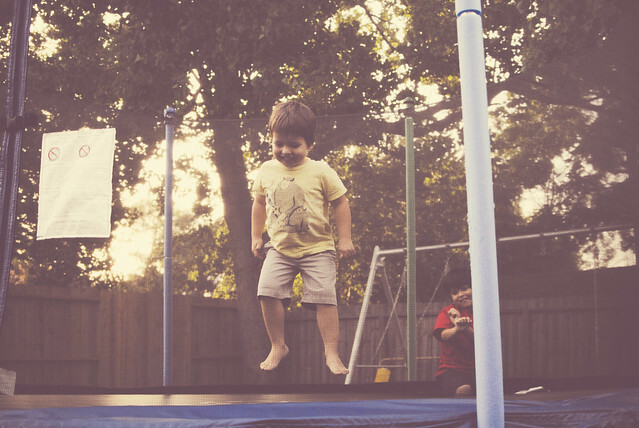 Plus, my kid secretly asked his grandpa to get him a trampoline for his birthday and HE DID (!!! ), so I now needed something comfortable to sit on while I watched my kid jump. My remaining lawn chair quickly started looking threadbare and once one of the webbing strips snapped, I put it away until I could figure out what to do. Buy new webbing and re-weave them? Crochet a hammock-like seat and pray I’m not too heavy for it? No. No, thank you. Instead, I Googled “DIY lawn chair” and one link led to another until I found myself HERE. 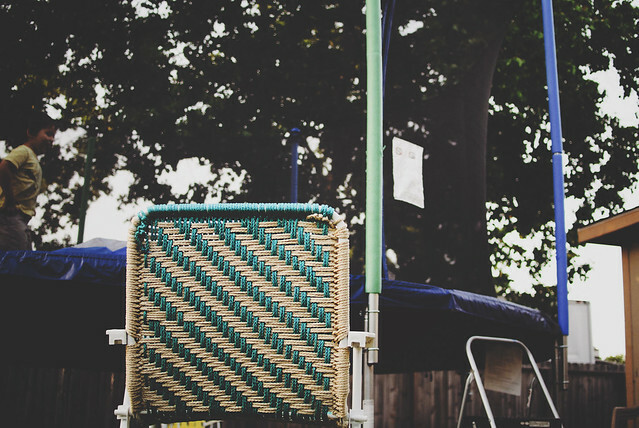 Macrame lawn chairs! Brilliant! Over the next few days, I watched the video several times, made a trip to Hobby Lobby, and got to work. It was more like weaving, in my opinion, but I think the knots you make at the end of each row with the hooks make it macrame. I didn’t have a book, so I just did a really simple weave pattern. I used two 100yd balls of 6mm Bonnie Macramé Craft Cord (Amazon link. I used ‘pearl’ & ‘teal’) and my biggest crochet hooks. I had a 15.75mm (US – Q) and a 19mm (US – S) hook. I would suggest two 19mm hooks! Another thing I would suggest is gloves! My hands were SO sore while working on this. I don’t know if I HAD to pull the cord as tight as I did, but I felt like I should, so that the seat wouldn’t sag under an adult’s weight. You never know who is going to sit in your chairs and if I learned anything from that birthday party incidence it’s that a busted chair is the worst thing a hostess can provide for her guest(s). If I would have used just one color, the lovely herringbone pattern would be more apparent. I do like the diagonal stripes, though. 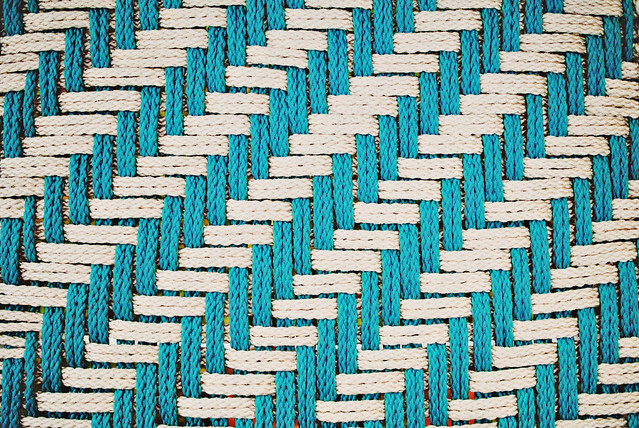 The pattern was pretty basic: the contrasting color (beige) went OVER 3 groups – or 6 strands – of the first color (blue), then UNDER 3 groups of the first color. On the next row, you repeat the same pattern, but you shift it over once. After the first few passes across, it’s a really simple process. If it hadn’t been so hard on my hands, the other chair would be done already. I’m in love. If you have any questions, let me know! Check out the video on the page I linked above. I referenced the video A LOT until I got my rhythm going. Imagine me pausing with my hook in one hand and my head cocked to the side with a “huh? !” face several times. It was a really interesting project as it was something completely new to me! 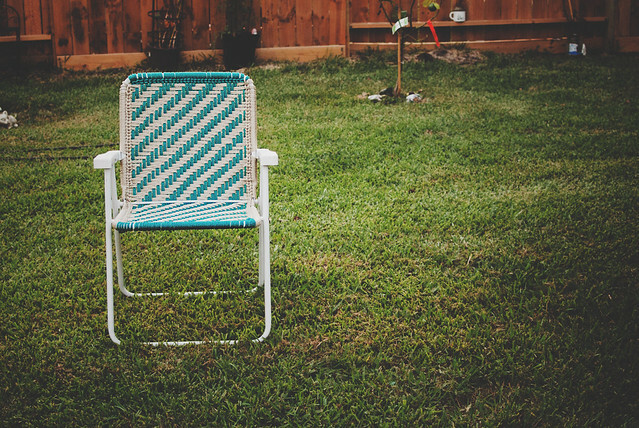 Would you save your torn up lawn chair? How so? Ever tried to macrame one? That’s my view. And yes, my kid is mid-Gangnam style in the background. I love how this looks! I definitely want to do this some day! Lisa, that looks amazing! Great job! I hope your guest took it okay and their pride wasn’t hurt too badly. Oh Im in love with this idea. I am so pinning it! I dont have any of these chairs but I would not have thrown them out. Thank you! Just this morning I was returning our various lawn chairs to the yard after mowing and I felt so sad that my beloved yellow & white striped one clearly needed to be tossed since the plastic webbing has started to crack and break. Now I can fix it! And, it can look even spiffier than it did originally. You’ve made my day. This looks great! 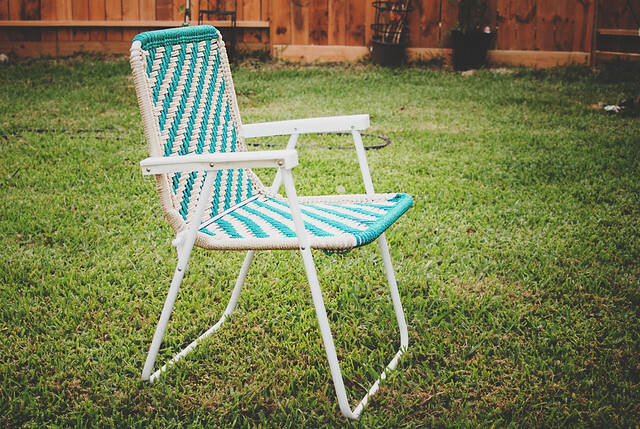 Chic and classy (for a lawn chair)! I have been following your blog forever, your projects are awesome and your boys are too cute! This is addorable, I love it!!! I’m so excited that you did this. 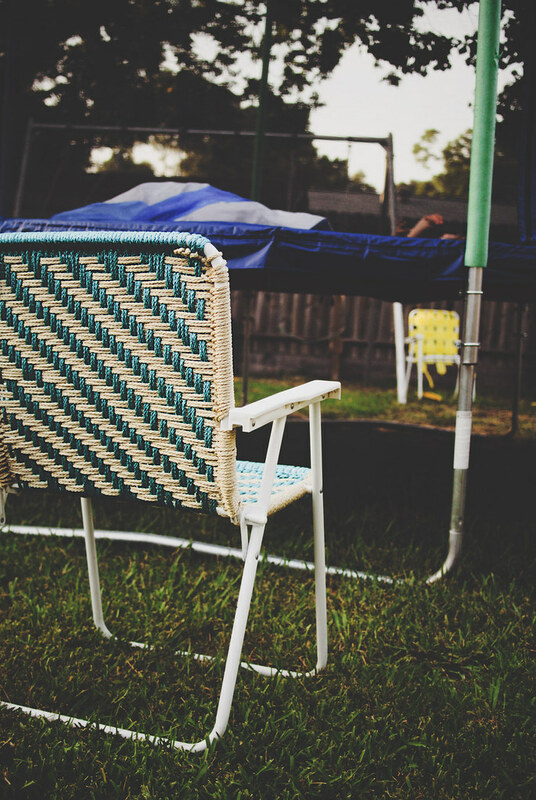 I have two old chairs I plan to redo this weekend! I have made 1 lawn chair for my mom and a lounge chair for my daughter, now I am making another lawn chair for my son. The design on it is a wolf head, but it is single corded not double. I am not sure how to do the single corded design, can you help me?? I cannot figure out from the video how to get started — my cord underneath the chair gets wrapped up in the chair legs, etc. I’m an accomplished knitter, sock maker, and proficient in crochet, but I cannot figure how to get started. I got the first strand up over the top, but then proceeding to the bottom .. a mess! What am I doing wrong? Would like to get many patterns for macrame lawn chairs.